Fermented, foraged, whole-grain and invigoratingly herbal, the flavors of the moment are straight out of Central and Eastern Europe. Why does this old-world food seem so right-now? STICK-TO-YOUR RIBS stews, vegetables simmered into submission, doughy dumplings as chubby and pale as a child’s fist: Mention Eastern European food to most Americans, and these are the images they’ll conjure. Never mind that at its largest, the U.S.S.R. covered one-sixth of the earth’s land, swallowing spice routes and diverse empires that were sustained by much more than pork and potatoes. Twenty-five years after the dissolution of the Soviet Union—and with more than 14 million Russian, Ukrainian and Polish Americans among us—popular notions of Slavic food have remained largely frozen in amber. Blame it on cultural baggage: The Slavic penchant for hospitality has always been most vigorously practiced at home, and the privations of life behind the Iron Curtain during most of the last century hardly made for a robust restaurant culture. Nevertheless, a new generation of stateside chefs is embracing Central and Eastern European ingredients and techniques, putting fresh—dare I say hip?—spins on a colorful cuisine that ranges far beyond stereotypical babushka cooking. At Apteka, a modern Polish restaurant that debuted in Pittsburgh, earlier this year, the dishes defy tired assumptions about what this kind of cooking can be. “Yes, I love pierogies. But when I think of spending my childhood summers in Poland, I think of mirabelle plum jam and smoked eel and amazing bread,” said co-chef/owner Tomasz Skowronski. He and his partner, Kate Lasky, have assembled a menu of Rust Belt-rooted and entirely vegan riffs on Polish classics—salads of sorrel, mustard greens, shallots and apples; soft Silesian-style dumplings in a broth of fresh carrot juice and porcini and fennel-infused almond yogurt. Those flavors are striking a chord nationwide, often in restaurants not otherwise identifiably Eastern European. 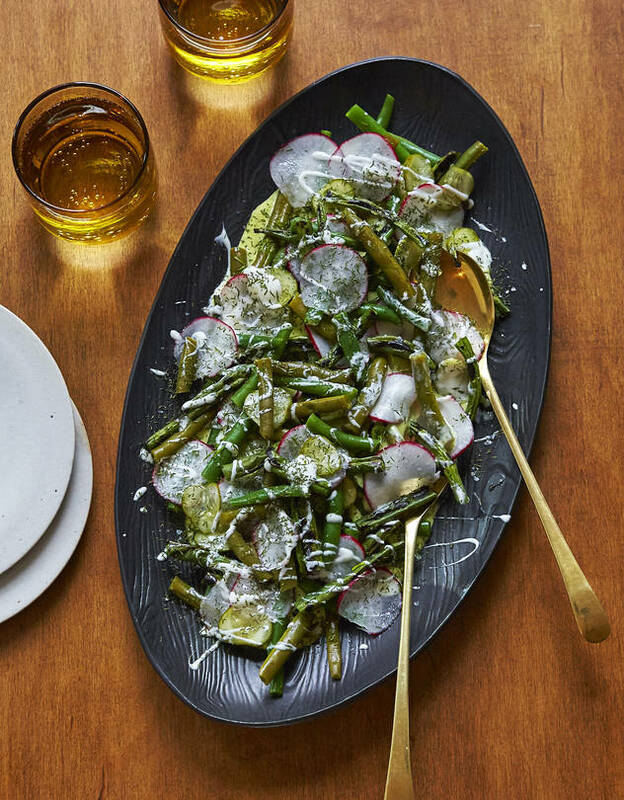 This summer, I sat down at Gristmill, a locavore pizza place in Brooklyn, and was floored by a salad of briny cucumbers and charred and pickled beans topped with tangy kefir cream and dehydrated dill that tasted like it could have been flown in from a dacha outside Moscow. For New York-based chef Nastasha Pogrebinsky, who emigrated from Kiev to the U.S. in 1991, it still comes as a surprise to see American restaurants featuring the flavors of her childhood. When she opened Bear in partnership with her brother, Sasha, on the edge of Long Island City in 2011, she had to confront a few voices in her head. “As a teenager, people really did call us ‘commies,’ and I worried about people seeing my food as too ‘Russian’ or ‘ethnic,’ ” she said. Her neighbor Vitaly Paley can relate. Over the last 20-plus years, the Russian-born, French-trained chef has racked up accolades running four Portland restaurants. While his refined seasonal-Northwest style was informed by memories of the wholesome ingredients of his Soviet youth, he’d never served blini in his life. “It honestly never occurred to me,” he said. Then, two years ago, at the urging of his friend, food writer and fellow Russian expat Anya von Bremzen, Mr. Paley agreed to stage a playful Soviet-themed pop-up dinner. His ambivalence is apparent even in the name he gave it: DaNet (“Yes/No”). 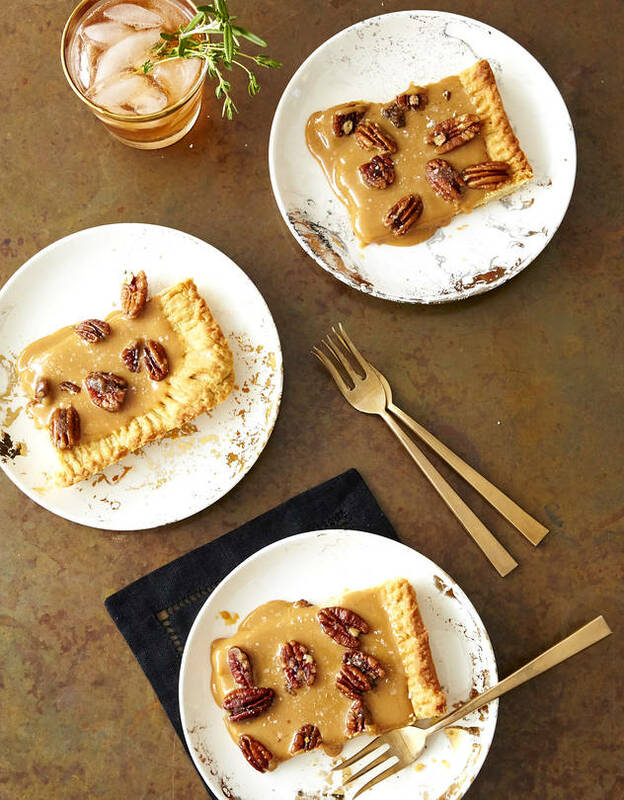 But after poring over Russian cookbooks, mining Armenian and Uzbeki recipes, reconstructing elaborate Tsarist caviar-topped crepes and flaky fish pies, and reinterpreting currylike Georgian chicken satsivi with Oregonian game, he found himself a man invigorated. “After years of trying to forget where I came from, it got under my skin,” he said. Later this month, Mr. Paley launches a full Russian afternoon tea at Portland’s Heathman Hotel, complete with Kiev tortes, his grandmother’s sour cream cake and vintage samovars. The trend extends across the Atlantic, too. 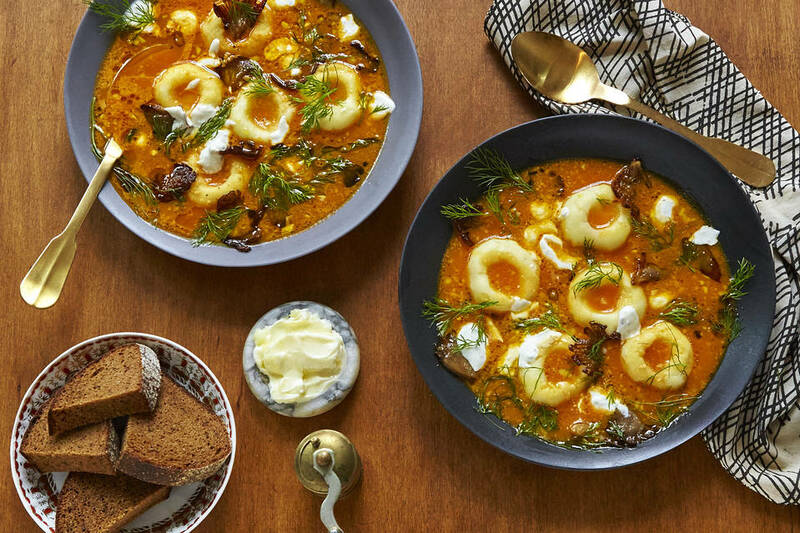 In Britain, the 2015 cookbook “Mamushka,” byOlia Hercules, revealed a vividly flavorful Ukrainian table, and Zuza Zak’s “Polska,” published in September, puts a 21st-century gloss on its author’s Polish gastronomic heritage. FROM DENSE BLACK spelt buns to sour rye rounds studded with caraway, bread is so central to the Slavic table, it is baked right into the language. The Russian word for hospitality, khlebosolny, translates literally as “bready-salty”—a reference to the traditional gesture of welcoming guests with a platter of bread and salt. Nowadays, in Poland, that platter might just as likely be piled with little kanapki, small open-face sandwiches meant for sharing and socializing (especially over shots of bracingly cold vodka). You can pick up toppers of cured fish, briny roe, pickles, puréed eggplant or herb-flecked soured cream at your local Eastern European market. 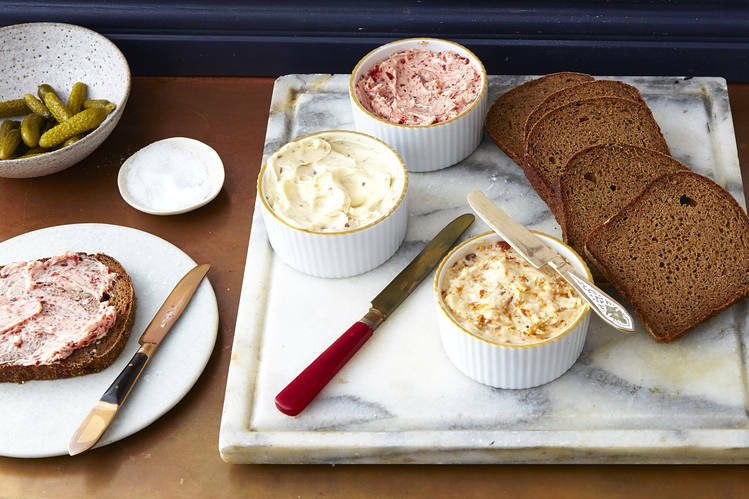 Or, take a page from “Polska” author Zuza Zak’s playbook and slather slices of dark, yeasty sourdough and rye with easy compound butters amped up with anchovies, earthy chanterelle mushrooms or rosy beets. Sometimes the simplest things are the most sublime. Drain 1 (2½-ounce) can oil-packed anchovies. Add drained anchovies to a food processor, along with 14 tablespoons unsalted butter, softened. Process until completely blended, scraping down sides of bowl as needed. Transfer to a serving dish and chill in refrigerator at least 30 minutes before serving. Add 1 clove garlic, chopped, a pinch of kosher salt and 1 small beet, peeled, roasted, cooled and roughly chopped, to a food processor. Pulse once to combine. Add 14 tablespoons salted butter, softened, and process until completely blended, scraping down sides of bowl as needed. Transfer to a serving dish and chill in refrigerator at least 30 minutes before serving. Melt 1 tablespoon salted butter in a skillet over medium heat. Add 1 clove garlic, chopped, and a large handful of fresh chanterelles to pan. Fry until mushrooms are softened and lightly browned at edges, about 5 minutes. Season with a pinch of kosher salt, remove from heat and let cool to room temperature. // Add cooled mushrooms and 14 tablespoons salted butter, softened, to a food processor. Process until completely blended, scraping down sides of bowl as needed. Transfer to a serving dish and chill in refrigerator at least 30 minutes before serving. Zoladkowa is a bitter Polish vodka that has been infused with dried fruit, herbs, and botanicals for a pleasant bitter edge. If your city has a large eastern European population, you may find it in a local store, or you can order it online at winesfortoday.com. Otherwise, you might try substituting aquavit or an Old Tom gin, like Ransom, for a similar effect. Vigorously muddle ½ tablespoon fresh thyme, ½ tablespoon fresh rosemary, juice of 1/2 lemon, 2 ounces Zoladkowa vodka and a dash of Angostura bitters in a large glass for 2-3 minutes. Strain into a clean ice-filled tumbler and top with tonic water. 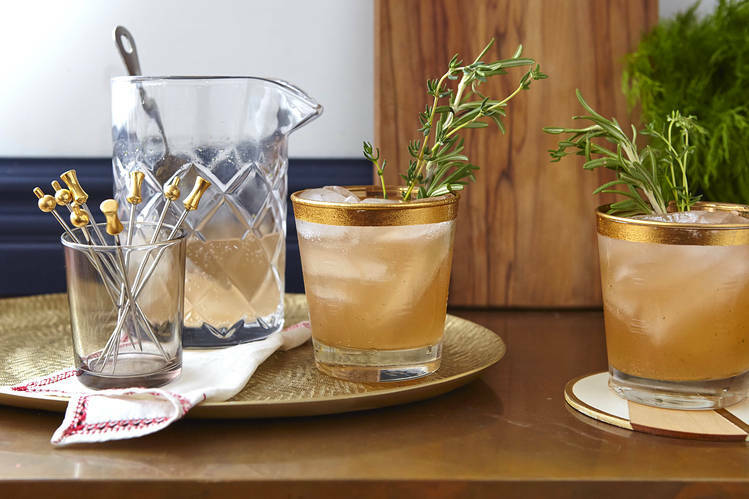 Garnish with a sprig each of rosemary and thyme.